Lebanese-American philosophical essayist, novelist, mystical poet, and artist. In the 1960s Gibran's works influenced especially American popular culture. He also illustrated a number of his books with his own drawings. Gibran believed that if a sensible way of living and thinking could be found, people would have mastery over their lives. "The human heart cries out for help; the human soul implores us for deliverance; but we do not heed their cries, for we neither hear nor understand. But the man who hears and understands we call mad, and flee from him." Khalil Gibran was born in Bechari (Bsharri), Lebanon, a mountain village of Maronite Christians. A talented child, he was modelling, drawing, and writing at an early age. Gibran's mother took her children to the United States, but their father remained in Lebanon. The family settled first in Boston, then in New York. Gibran returned to Lebanon in 1897 for two years to study Arabic literature in Beirut at al-Hikma College. Gibran's artistic talents was recognized early and he was introduced to F. Holland Day, a photographer, who tutored him in art and literature. Through Day Gibran was given entrée to Boston society, where he acquired valuable contacts. Gibran's mother died when he was 20. His sister supported him while he established himself as a writer and painter. Gibran's most ardent benefactress was Mary Haskell, the headmistress of a progressive girl's school in Cambridge. She supported her protégé financially for most of his career. In 1904 Gibran had his first art exhibition in Boston. His first book, AL-MUSIQA (1905) was about music. It was followed by two collections of short stories and a novelette in 1912. From 1908 to 1910 he studied art in Paris with August Rodin. In 1912 he settled in New York, where he devoted himself to writing and painting. Though concerned with the transcendental in his books, the basic subject in Gibran's art was naked human bodies, tenderly intertwined . Gibran's early works were written in Arabic and are considered central to the development of modern Arabic literature. 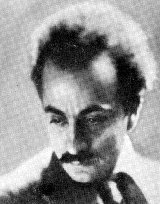 Gibran also wrote for journals published by the Lebanese and Arab communities in the U.S. From 1918 he wrote mostly in English and managed to revolutionize the language of poetry in the 1920s and 1930s. His first book for the publishing company Alfred Knopf was THE MADMAN (1918), a slim volume of aphorisms and parables written in biblical cadence somewhere between poetry and prose. Usually Gibran used prophetic tone to condemn the evils that torment his homeland or threaten the humankind. His style, a combination of beauty and spirituality, became known as 'Gibranism'. "I am a stranger to myself. I hear my tongue speak, but my ears find that voice strange. I may see my hidden self laughing, crying, defiant frightened, and thus does my being become enamored of my being and thus my soul begs my soul for explanation. But I remain unknown, hidden, shrouded in fog, veiled in silence." (from 'The Poet') In 1920 he founded a society for Arab writers called "Aribitah" (the pen bond), and supported the struggle to revolutionize the classically conservative Arabic literature. A very important channel for new ideas was Al Magar, the first New York Arabic newspaper, that Gibran wrote for. Other influential writers included Mikha'il Nu'aima (1889-1988), Iliya Abu Madi (1889-1957), Nasib Arida (1887-1946), Nadra Haddad (1881-1950), and Ilyas Abu Sabaka (1903-47). Especially Mikha'il Nu'aima's critical writings paved way to new freedom in poetic expression. Although Gibran was not a great poetry in verse, and most of his writings in prose should not be regarded as 'poetry', he opened doors to a new kind of creativity. Salma Khadra Jayyusi wrote in 1987 that Gibran's rhythm "fell on ears like magic, intoxicating in its frequent use of interrogations, repetitions, and the vocative; by a language which was at once modern, elegant, and original; and by an imagery that was evocative and imbued with a healthy measure of emotion. His vision of a world made sterile by dead mores and conventions but redeemable through love, good will, and constructive action deepened his readers' insights en enlightened their views of life and man." Gibran's best-known work is THE PROPHET, a partly autobiographical book of 26 poetic essays, which has been translated into over 20 languages. The Prophet, who has lived in a foreign city 12 years, is about to board a ship that will take him home. He is stopped by a group of people, whom he teaches the mysteries of life. The resulting 26 sermons are meant to emancipate the listeners. In the 1960s The Prophet became a counterculture guide and in the 1980s the message of spiritualism overcoming material success was adopted by Yuppies. Critics have not treated the book well. Its mystical poetry is frequently read at weddings even today. Among Gibran's other popular books is THE EARTH GODS (1931), a dialogue in free verse between three titans on the human destiny. For further reading: This Man from Lebanon by B. Young (1945); This Man from Lebanon by B. Young (1945); Kahlil Gibran: A Biography by M. Naimy (1959); The Parables of Kahlil Gibran by A.S. Otto(1963); Kahlil Gibran by K.S. Hawi (1963); An Introduction to Kahlil Gibran by S.B. Bushrui (1970); Kahlil Gibran: The Nature of Love by A.D. Sherfan (1971); Kahlil Gibran by J. Gibran and K. Gibran (1975); Gibran of Lebanon, ed. by S.B. Bushrui and P. Gotch (1975); The Meaning of Kahlil Gibran by M.S. Daoudi (1982); The Lebanese Prophets of New York by N. Naimy (1985); Kahlil Gibran of Lebanon by S.B. Bushrui (1987); Modern Arabic Poetry, ed. by Salma Khadra Jayyusi (1987); Kahlil Gibran: A Prophet in the Making by W. Shehadi (1991) - For FREE Mp3 Downloads: Selections From The Prophet By Kahlil Gibran Read By Donald Gordon Carty / A Spoken Word Tribute - Suom. : Gibranin keskeinen tuotanto on julkaistu suomeksi nimellä Idän ja lännen profeetta, teos Ajan virta sisältää Gibranin mietelauseita. Teokseen Mestarin sanoja (1993) on koottu Gibranin kaksitoista kirjaa. "The Prophet" by Khalil Gibran - A brilliant man's philosophy on love, marriage, joy and sorrow, time, friendship and much more. "The Madman" by Kahlil Gibran - Thought provoking collection of life affirming parables and poems. Listen to "Self Knowledge" Listen to "for the Rest of my Life"
I have recently discovered the titles of several other books by Kahlil Gibran and fortunately for all of us, they are still in print. All of these may be purchased directly from, or ordered through your normal book retailer.